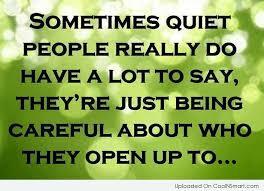 Shy people are often regarded as something they are ridiculously not! Don’t we all express a little bit of shyness at times? Then why do some of those same people get pleasure from judging someone who may be somewhat more shy than them? Shyness is unappreciated, undervalued and misconstrued. If you are not shy, then you will have no idea at all what I’m taking about, that’s ok though because I’m not judging. It is absurd to say to someone who very clearly likes to keep to themselves, that they are anything else but just ‘shy’! Shy people aren’t snobs nor are they timid, sheepish and certainly not mousy, as the english dictionary quotes, how preposterous. If you are a shy person, you were most likely born this way, a choice you made before you came into this life experience, a conscious choice you made for the growth of your Soul. There will certainly be many lessons you will learn from your shyly way’s while you are here. Your challenges will be different from the rest of the crowd, but there will no more lessons on your life program than anyone else on this planet, being shy isn’t a curse. Being shy isn’t a disease either or a character flaw and it certainly is not a physical or mental misfeature of any kind. To be shy is a gift of uniqueness, it is a knack for being extremely sensitive and that is a very beautiful thing in this World. If you are shy then you likely display a quick and delicate appreciation for other peoples feelings, awesome! Think of your cravings to be alone as wondrous and awe inspiring, not all of us need to be in the mix of things and constantly in and around the crowd. Needing to protect your personal space is a very good thing, it means you value your incredible energy, even if at times you don’t understand it. Sometimes we aren’t meant to know, and that is part of our Souls work. Please don’t beat yourself up for being something so very beautiful, shyness is wonderful. Someone I admired very much often said to me when I was growing up, ‘don’t be like everyone else, just be yourself’, she gave me the very best advise a Mother could give. I appreciate her words more than ever now because being different or weird is something of great value in a World that seems to get crazier and crazier.